Katie Omberg's series of self-reflections on her path to recognizing her sexual orientation continues in this third issue. This time around Omberg focuses on the anxiety she faced when debating whether or not she is a lesbian. Like many teens growing up, Omberg faced the problem of self-doubt, as it slowly eats away at her in the moments in which she is alone. It's not helped by a mother who seems always drawn to creating the worst case scenario. But unlike most teens, who might worry about being popular or their weight or other issues that are (relatively) easily discussed by others, Omberg had one thing on her mind: Am I gay? Eventually, this self-doubt caused resentment as she watched others form relationships and a major case of panic attacks. At some point, the issue has to be faced head on. But that's a tale for another issue. While my situation is not the same as Omberg's, I can completely relate to her worries, her fears, her desire to turn to avoidance, and not being ready for what had to come next. A lot of what she says here completely resonates with me, and I think it will for a lot of readers, regardless of their sexuality. 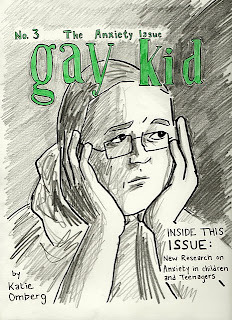 That's the strong part of this issue of Gay Kid. The weakness, though, is the art. I feel like there's less backing imagery this time around in the series, which reduces the impact of the words. The characters are sketchier, rougher, and not quite as well-defined as they were in Gay Kid 2. I know Omberg wanted to have this issue out before SPX, but with convention season mostly over, I hope that Gay Kid 4 is created a bit more slowly in order to match the powerful words with strong visuals as well. The Gay Kid series is so very important for anyone who has struggled with their identity, whether sexual or otherwise. I'm sure these issues are very hard for Omberg to create, because they deal with so many personal problems, and I'm very proud of her for not flinching and telling her story without hesitation or restraint. This is a must-read comic in my opinion, and one that I hope is collected when finished, so it can help teens who need it. We need books like this, and I'm definitely in for however many more issues Omberg chooses to create. Gay Kid 3 is not in Katie's store yet, but I'm sure you'll be able to buy it there soon.